She serves clients in the Virginia Beach, Newport News and Norfolk, Virginia areas. Kathy is a Certified Sandals Specialist with more than 10 years experince. She actually left her former career to become a Travel Consultant because of her first experience as a guest at Sandals resorts! 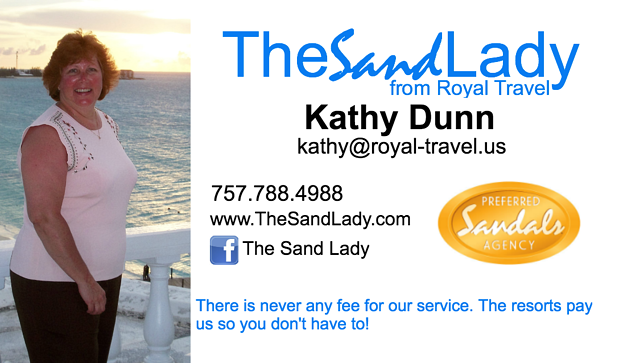 We have tasked Kathy with customizing the perfect all-inclusive package for each client's travel needs, and she is committed to helping you make memories that will last forever. Kathy says her favorite part about her job is sharing first-hand knowledge and tips about each of the resorts and islands. Kathy is a Coast Guard wife. She and her husband have 2 children and live in Yorktown, VA. Learn more about the Sandals and Beaches resorts and current promotions. Ready to Plan your Vacation?